One of the burning questions about Dr. John Larlee has been his whereabouts before he showed up in Maugerville. We all knew he emigrated from France; we just weren’t sure when and where he first went when he got to North America. Then I found two tantalizing clues on the Internet: one in an old book and another on a website about the Metis, a people of mixed North American aboriginal and European heritage. The clues led me to the Hudson’s Bay Company, the London-based fur trading company, but then I came to a dead end. Every once in a while I will “Google” John Larlee just to see what might come up and one day, it did – in a big way. I found a Masters Thesis and a Doctoral Dissertation whose focus was Anthony Henday and the Hudson’s Bay Company. In both documents I found references to Jean-Baptiste “de” Larlee! In the summer of 1759 two young Frenchmen showed up at the door of the York Factory, located in the northern part of what is now Manitoba on St. James Bay. 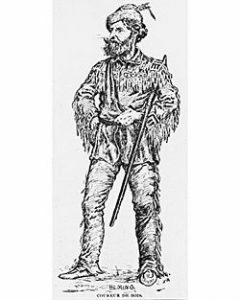 One of the men introduced himself as Jean-Baptiste Larlee and said that he had been the master at the French fur trading post at Pascoyac. Had been was the operative phrase. The French were abandoning the trading posts and moving west and south away from the disputed territory that the French and English were currently warring over. Both young men were seeking employment with the English. For providing this information, Jean-Baptiste was branded a traitor by the Metis. If you wanted to be a legitimate fur trader in the late 17th and early 18th centuries in New France, you needed to have a permit. To gain such a permit meant applying to the Jesuits and they were very particular about who got permits. It was the habit of many young men to circumvent normal channels and go off on their own. They would trade directly with the natives and learn from them how to survive in the wilderness. For these young men it was an opportunity to make their fortunes and provide a better life than they might have had. The fact that young Larlee had worked his way up to Master of a trading post most likely meant that he had been there for a while and had done well for himself. Jean-Baptiste Larlee ended up at Hudson’s Bay Company’s Albany Fort located at the bottom of St. James Bay where he was “contracted” as a trader (but never became a full employee) until 1762. This wasn’t by his choice and his termination was due to what might have been a conflict contrived by the local natives who apparently didn’t like him. It’s also most likely that Larlee greatly improved his English language skills during this time. There is a letter he wrote to London in 1760 that was written in French. By the end of his time with HBC, his correspondence was in English. The next time we see a reference to Jean-Baptiste Larlee, he is in Maugerville as John Larlee where he develops a strong reputation as a good doctor with no mention ever made (to my knowledge) about his time as a fur trader. At least we can now say he was never a part of Montcalm’s army. Thanks for suggesting I visit your Facebook site with a link to this post. I still have some unanswered questions in my mind regarding John Larlee. However,I agree with your conclusion that Jean-Baptiste Larlee is probably the same person. Many history and genealogy books have been written regarding the 1763 Maugerville immigrants. Perhaps one of us (in the near future) will locate a library book that provides even more detail on John Larlee’s life. I am descended from John Larlee. His daughter Elizabeth married Daniel Fales and their daughter Margaret married Nelson Stronach. Nelson Stronach was my father’s great-grandfather. I look forward to being in touch with other members of the family.